Protein folding is a process by which a protein structure assumes its functional shape of conformation, and has been the subject of research since the publication of the first software tool for protein structure prediction. Protein folding in silico approaches this issue by introducing an ab initio model that attempts to simulate as far as possible the folding process as it takes place in vivo, and attempts to construct a mechanistic model on the basis of the predictions made. The opening chapters discuss the early stage intermediate and late stage intermediate models, followed by a discussion of structural information that affects the interpretation of the folding process. The second half of the book covers a variety of topics including ligand binding site recognition, the "fuzzy oil drop" model and its use in simulation of the polypeptide chain, and misfolded proteins. 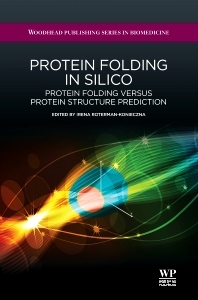 The book ends with an overview of a number of other ab initio methods for protein structure predictions and some concluding remarks. Dr Irena Roterman-Konieczna heads the bioinformatics group at the Jagiellonian University Medical College and the Faculty of Physics, Astronomy and Applied Computer Science. Her background is in theoretical chemistry, and her research focuses on bioinformatics, with specific focus on protein structure prediction.